Very nice! A must see experience! Highly recommended. A lovely night out in a special venue with accomplished artists. We had a Mozart evening - artists all in period dress.. Highly recommended. Friendly staff and incredible musicians, you just don't believe the sound you get when they start playing. They played a whole playlist of Mozart, it was beautiful. Too hot ...no air circulation and the seats were very uncomfortable. We left half way through the event. Certainly not Wirth the Money! Encantador, te transporta a una velada en la epoca de Mozart. Los músicos son muy buenos, la soprano es increíble tiene una voz bellisima, para los amantes de la música es imperdible!!! A well organised event, the orchestra knew their stuff. A couple of hours to de-stress yourself in a beautiful setting. My only complaint was that they also had a couple of dancers, but these could only be seen from the from/VIP seats. An enjoyable evening. 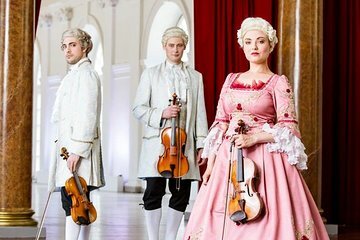 Period costumes, excellent music, magnigicent setting. We did not hace dinner, but those who did said it was superb.